-WordWatch manages your all of your keyword bids, ensuring you get the most clicks or conversions regardless of your budget. While it has only been a short time I am very impressed with there overall knowledge of Google Adwords. I had and issue with conversion tracking that I contacted Google about and they were no help at all. I explained this issue to WordWatch and they solved the problem quickly. We are now off to the races with everything set up and ready to go.Simple website that explains things in very easy to understand terms. Fast response to questions and concerns. Everything was quickly setup. Simple website that explains things in very easy to understand terms. Fast response to questions and concerns. Everything was quickly setup. I set up two accounts with WordWatch. One I was never able to log into, so I cancelled it and created a new one. Ultimately, I was charged for the older account. When I asked service to cancel it, they told me I have to log in to the account to do so, which I was never able to do. They didn't seem to understand the catch-22 involved there. Their service, once being activated, actually caused a rise in PPC, instead of a decline for the accounts I linked it to. The other accounts stayed mostly the same, and all 15 of the sites listed on that account are very similar.They give you $100 adWords credit. They give you $100 adWords credit. The credit isn't valid when you try to use it. You can see on RipOff Report that others have experienced the same issue. Their service seems to do the opposite of what they advertize. Also, they will charge you after you cancel your account. 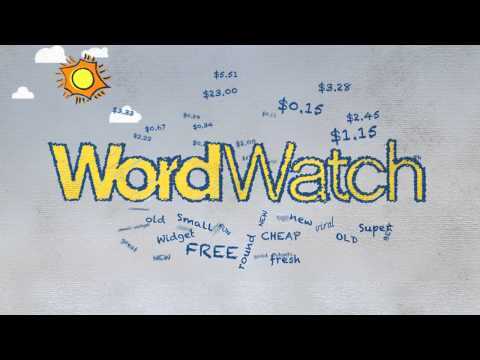 WordWatch offers plans from $0-$99/month for small businesses. Agencies and freelancers can manage multiple accounts starting at $199/month for 5 accounts. - Saving time, money and avoiding the hassle associated with managing AdWords campaigns. - It's like having an SEM expert work for you 24/7. - Customer service by phone, email and live-chat. - More clicks and conversions with AdWords. Below are some frequently asked questions for WordWatch AdWords. Q. What type of pricing plans does WordWatch AdWords offer? Q. Who are the typical users of WordWatch AdWords? Q. What languages does WordWatch AdWords support? Q. Does WordWatch AdWords support mobile devices? Q. Does WordWatch AdWords offer an API? No, WordWatch AdWords does not have an API available. Q. What other apps does WordWatch AdWords integrate with? Q. What level of support does WordWatch AdWords offer? Q. Which apps is WordWatch AdWords compared to most often?